Auroral colour camera system was originally developed at the University of Calgary to support automatic auroral image analysis. A prototype camera was installed in Nyrölä, Finland in 2005, and the station is still operational. The camera is called Rainbow. 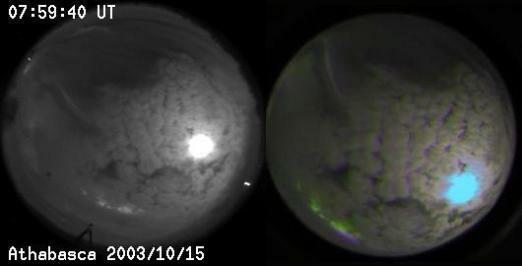 To illustrate the difficulties in analysing the gray-scale images, here are two images captured almost simultaneously at the Athabasca University Geophysical Observatory with a panchromatic images (left) and Rainbow (right). The fields-of-view are slightly different as are the orientations of the images. 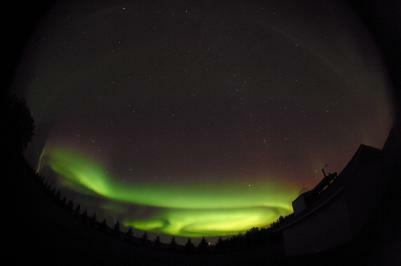 Nevertheless, both images show an auroral display behind the clouds. The bright object to the right of the centre is the Moon. There is some bright aurora in the lower part of the images. 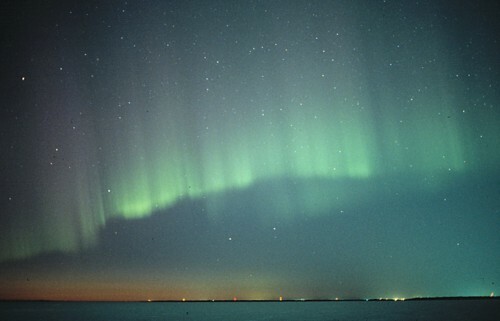 Notice how distinctive the green aurora is in the colour image. The gray-scale image does not provide enough information alone: a sequence of images is needed to verify the movement of the aurora in order to determine that auroral emission is present. MIRACLE Rainbow cameras are placed at Kevo, Muonio and Helsinki. The images are read in a fast mode which includes binning in one direction. An additional colour conversion is needed to produce full colour 8-bit jpg images. Due to the broad-band colour matrix integrated on the CCD these instruments capture all light within the visible wavelength range, and are thus very sensitive to light pollution. Sample colour animations are available at Auroras Now service under "Earlier Auroras". More detailed description of the Rainbow colour conversion can be found in Syrjäsuo et al. Recent study of Rainbow spectral estimations by Jackel et al.